﻿﻿ Students who enroll in the Newspaper Production course serve as the staff of The Columbian, the student newspaper of Columbia College. In this course, students learn about journalism principles and practices and apply them in the stories they write for The Columbian. The staff produces three issues of The Columbian online each semester. 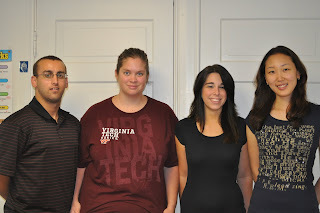 The Columbian staff for Fall 2010 includes Christina Delgman, Hyunji Lee, Jucyndia Meeks and Jimmy Patterson. • Delgman, junior, is a photography major covering Campus Life. • Lee is a senior majoring in General Studies with minors in environmental science and English. She is covering the Columbia community. • Meeks is a junior majoring in creative writing. She is covering Athletics. • Patterson, a transfer freshman, is a photography major. He will cover Academic Affairs.